Let’s begin to understand iPhone 5 with Apple’s previous famous device iPhone 5S, its amazing fast performance, high definition camera quality and long-time battery is the reason of its popularity. On the other side because it is “S” brand iPhone so a lot of people still think that it is the update version of its predecessor so they are waiting for iPhone 6 for a change. 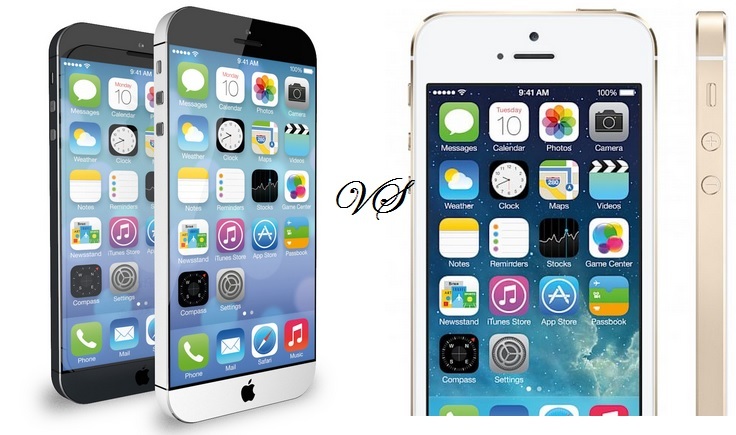 iPhone 5S designing is just like apples previous iPhones with aluminium body and almost same weight in spite of that it is the thinnest and lightest phone among your other favourite brands available in market so we can say that it is suitable or perfect according to your choice. When we talk about colors so it has silver, gray and gold as well. According to iPhone 6 predictions ‘Apple’ will maintain the quality just like its previous phone device but most probably its display will look like much stylish as compare to iPhone 5S. Another report says Apple is going to make its new device with dual iPhone display that will be larger than normal. Well however it the default screen size of 4.5 to 4.78 inch iPhone and 5 inch “Phablet” iPhone launching in series are all the some by some aspects. If you want to complain for any of the iPhone display colors, sharpness or brightness that would be much difficult for you because they already define each and everything in details, Just like it unchanged display from last predecessor of 4 inch IPS LCD retina and 1136 X 640 pixel fine resolution and Apple said about it that it is optimistic for quality and easily able to operate in smartphone scenario. Mostly people use to buy big screen phone so it could be the Apple’s motto to capture market by launching this type of big screen phones. The upcoming iPhone 6 with 4.8 inch screen is look like that it could be trouble for manufacturer. It looks like Apple is going to introduce 1080 HD quality in iPhone 6. Apple A7 chips of iPhone is the first processor for mobile using 64 bit on the other side dual core 1/3GHz processor along with 1 GB RAM has been performing all and according to a general idea further apps are coded for 64 bit boost speeds. iWork suits of Apple is taking advantage from charged chip of turbo. It is possible that iPhone 6 will come with some previous specification such as 16 GB and 6GB, 32 GB storage along with lighting connector without microSD, Wi-Fi, Bluetooth and with 4G options. iOS-6 to iOS-7 was already used in previous handsets so it is possible that in iPhone 6 there will be iOS-8 with different design so that question raised is how Apple will do with touch scanner. With all this many other technologies would be in their new device. In camera not much changes seems like that still rated 8 megapixels but the sensor will be much better than before with more sensitivity that will gives amazing image quality on you click, LED flash with white LEDs will be there to show natural color quality. It will come with 3 different sizes to fulfill every requirement of customer. The sizes will be 4 inches and less then it. Another news that we get from our resources that it will have some iPhones old features with infrared enable to function as well as remote controller and Apple TV option. There will be wireless charging facility that some companies are already following such as HTC, Nokia and Samsung that will help you to charge your phone without any wire because it has capability to store energy without wire. Many companies are working to make there devices flexible that can prevent user from dropping and damaging. So there is many chances that now Apple will bring something in their device in sense of flexibility such as glass, plastic or silicone. The most important feature of this phone is thumb scanning security that will bring this phone to next level generation phone in sense of security in phone unlock security and in payment method as well, that will recognize you by your thumb pattern and then it will proceed you to next step. No one can guess that exact release date of iPhone 6 because last time iPhone 5 was released in September 2013 so most probably iPhone 6 will be release in next year 2014. Why No After-Sales Support Is Provided by Tech Companies?